This procedure is to provide a systematic approach to the treatment of plagiarism in academic work at the University, in accordance with Regulation 6.1.1 – Plagiarism. This procedure sets out the processes for reporting, recording, adjudicating and penalising incidents of student plagiarism. Plagiarism is a form of cheating and is a very serious academic offence that may lead to exclusion from the University. Plagiarised material can be drawn from, and presented in, written, graphic, auditory and visual form, including electronic data, and oral presentations. Plagiarism occurs when the origin of the material used is not appropriately cited. Adequately and consistently educating students in how to correctly research, present and reference their work in an Australian educational environment. Ensuring that students are clearly informed of what constitutes plagiarism and that it is an unacceptable academic practice. Developing innovative approaches to assessment that may reduce the opportunities for students to plagiarise as well as promote better learning outcomes. Supplying students with information on how to avoid plagiarism and how to access information on correctly preparing their work. Providing a fair and consistent approach to managing cases of alleged plagiarism within Schools/Centres. Making available a software service that allows students to self-assess their work for originality and referencing and citation omissions. Ensuring that the penalties for plagiarism are clear and readily understood by staff and students. This procedure applies to all University students. Assessor: Person, or persons, responsible at the School or partner provider for the assessment or moderation of student work. Boolean Search: Type of search allowing users to combine keywords with operators such as AND, NOT and OR to further produce more relevant results. For example, a Boolean search could be "hotel" AND "New York". This would limit the search results to only those documents containing the two keywords. Collusion: The unauthorised act of a student presenting work, which is the outcome of directly working with others, as his or her own. Common Knowledge: A commonly agreed knowledge/fact that is from numerous sources and generally undisputed. For example, 'the Earth is the third planet from the Sun'. It may also include general folklore, traditions, observations or aphorisms, such as 'Count Dracula lived in Transylvania' or that 'Life wasn't meant to be easy'. Common Knowledge does not usually require a citation. Cooperative Learning: The informal process of students interacting to enhance their learning outcomes, which is encouraged. Group-work: The authorised act of a group of students producing either a common assessable work or work as part of a larger project. Integrity in Assessment: Is achieved when students receive proper credit for assessable work which is clearly their own. Intentional Plagiarism Intentional plagiarism occurs when a student knows that he or she is passing off someone else's words, material, works or ideas as their own in order to gain an advantage or avoid work. Plagiarism: The presentation of the works of another person/other persons as though they are one’s own by failing to properly acknowledge that person/those persons. Proper acknowledgement means to clearly identify which parts of a work originate from which source. Plagiarism Detection Software: The online web-based text-matching software that works by comparing electronically submitted papers to content located on the Internet and proprietary databases as well as the work of other students whose papers have also been submitted into the system. Plagiarism Officer (PO): Person, or persons, responsible at the School/Centre for investigating plagiarism. Also referred to within the document as PO. Poor Referencing: The presentation of works of another person/other persons with incorrect/inadequate attribution to those person(s). Poor referencing can be considered as a lesser form of plagiarism where the student(s) was not attempting to gain an unfair advantage. Generally, if an attempt is made to indicate that the student has taken the idea from another source then it should be treated as poor referencing (eg. quotation marks but no citation). If there is no attempt made to indicate that a particular part of a submission is from another source then it may be considered plagiarism instead of poor referencing. Unintentional Plagiarism Unintentional plagiarism occurs when students use the words or ideas of others but fail to quote or give credit, usually because they do not know how. Submitting work purchased online or prepared by a third party as one's own. Plagiarism, either intentional or unintentional, is a practice which contradicts the University’s values of effort, excellence and integrity. There is an expectation that students will prepare and submit work that is their own, and where appropriate, acknowledge the work of others. All academic work at the University requires the use of recognised referencing styles. Those styles acceptable to the University are detailed in the General Guide to Referencing (the Guide). Schools/Centres must specify within the course description which style is to be used from the Guide, and any technical or discipline-specific referencing requirements. In the absence of specific instruction from the Course Coordinator or course description, students should use a style from the General Guide to Referencing. plagiarised, and be penalised in accordance of Regulation 6.1.1 and this procedure. Maintain confidential records of previous breaches. Provide information to students on acceptable referencing practice, including the required referencing style. Advice to students on protecting their own work from theft/copying. Model best practice referencing in own practice. Avoid an excessive number of assessable tasks. Ask students what they learned from a particular task. Making positive use of collaborative work having provisions to counter 'free riders'. As appropriate, using invigilated assessments. Actively engage and seek academic support or self-educate based on feedback provided by staff. Software may be utilised by students to detect plagiarism. Training and education will be made available to students on the use of any software utilised. Conduct a keyword or phrase search using a Boolean search on a search engine, the University Library Database for any phrases suspected of being plagiarised or use plagiarism detection software. Responding quickly to incidents of cheating /plagiarising in accordance with the relevant University policies and procedures. The general principle when enforcing Regulation 6.1.1- Plagiarism is to ensure fairness and students' well-being as much as possible. The aim is to educate and foster stronger learning environments, not to blindly punish. when regarding referencing, students should be considered as novice learners if they are enrolled in their first year of studies and/or have not been in a learning environment for some time. Students provided tabbed text as a block quote and omitted a few citations through oversight or a lack of knowledge. In consultation with the Plagiarism Officer, the assessor rates the magnitude of the issue to determine whether it is enough to warrant the charge of plagiarism and put the student through the plagiarism process. Unintentional plagiarism occurs when students use the words or ideas of others but fail to quote or give credit, usually because they do not know how. putting quotation marks around part of a quotation but not around all of it. 1. Confirm if the student has been previously reported for unintentional or intentional plagiarism. If the student has been previously reported for plagiarism, then the assessor, in consultation with the relevant Plagiarism Officer, will treat it as Intentional Plagiarism and implement Part A, Part B or Part C of the Student Plagiarism Procedure. 2. Educate student(s) about plagiarism. Use examples to discuss what plagiarism is, why it occurs and how the student can avoid plagiarism. Review and/or teach skills such as summarising, paraphrasing, critical analysis, argument development, referencing and citation. Explain how using these skills effectively can reduce the instances of plagiarism. Refer students to academic support services for further training and assistance. Encourage student(s) to use plagiarism detection software before assignments are submitted. Explain to the student(s) the meaning of the Plagiarism Statement Agreement that the student(s) have signed on their Assignment Cover Sheet and how it is a legally binding agreement with the University. Set replacement assessments for the student(s). Warnings and outcomes must be communicated in writing to the student(s) and recorded by the assessor on a Plagiarism Register, which each School/Centre will determine based on their operational processes. Cases of unintentional plagiarism will not be included on the student(s) formal academic record and will be destroyed upon completion of their program. In more serious cases, where it appears the student(s) intention was to gain an unfair advantage over other students, and in the opinion of the assessor, the above actions would not maintain fairness for other students, then the assessor may decide to formally report the student(s) for plagiarism. Intentional plagiarism occurs when a student knows that he or she is passing off someone else's words, material, works or ideas as their own in order to gain an advantage or avoid work. Purchasing pre-written research papers is one of the most blatant forms of intentional plagiarism. Other examples include copying an essay or article from the Internet, online source, or electronic database without quoting or giving credit, and cutting and pasting from more than one source to create a paper without quoting or giving credit. 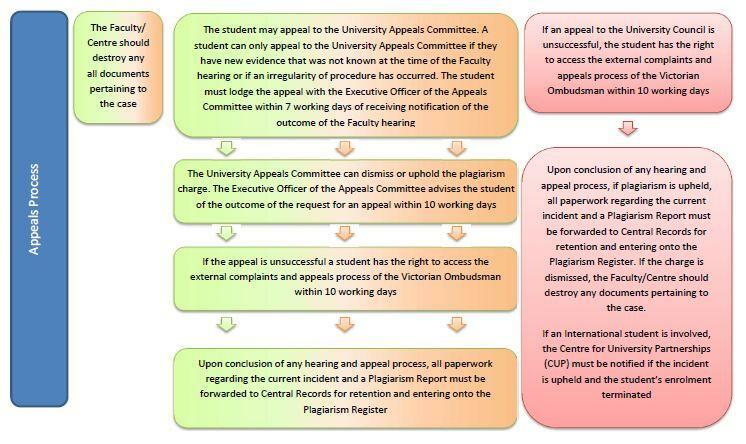 The following flowchart outlines the process to be followed once the assessor has decided to lodge a formal report for plagiarism in accordance with the procedure under Regulation 6.1.1 - Plagiarism. Due to the nature of plagiarism and the time constraints involved, Schools/Centres need to ensure that students are notified immediately where evidence of plagiarism exists. The University’s goal is to provide a fair and consistent approach to managing cases of alleged plagiarism and ensuring that the penalties for plagiarism are clear and readily understandable by staff and students. At any stage of an investigation into alleged plagiarism, the student/s should be advised to remain enrolled in their program for the duration of the process, unless advised otherwise. The steps in Part A apply to the initial reporting of a first, second or third incident of alleged plagiarism. 1. Determine whether a student has plagiarised an assessment task according to the Plagiarism Determination Guide. Refer to the previous section, Detection of Plagiarism and Plagiarism Determination Guide to assist with determining plagiarism. If the Assessor is located at a Partner Provider, then they should contact the Course Coordinator in relation to the alleged incident. The reporting of intentional plagiarism requires submission of a Plagiarism Report to the School Plagiarism Officer via the relevant Centre for University Partnerships (CUP) Liaison Officer. Prepare documentary evidence of what parts are plagiarised and original sources (if possible). Contact the Dean/Director or nominee (or the Plagiarism Officer) providing relevant documentation and evidence for investigation. Contact Central Records via email to ascertain whether the student has any previous registered plagiarism incidents. The PO must contact Central Records to establish the incident number as each occurrence carries a different penalty. Written correspondence should include name, School/Centre and position title of the staff member submitting the request. If the student has any previous plagiarism incidents, the details will be forwarded to the PO via email. If there is no match, Central Records will inform the PO via email. The PO proceeds on the basis that it is the student’s first incident. Central Records Central Records will only forward details relating to previous plagiarism occurrences of a specific student to the PO via email; staff will not be given access to the University’s Plagiarism Register. Once it has been determined that a student has incurred their first incident claim of plagiarism (1st, 2nd or 3rd incident), they should immediately be notified in writing of the claim, evidence, and forfeiture of credit. Students can seek assistance with their plagiarism case through the Federation University Student Advisory Service. Students can access academic support services through the Student Futures Program, CLIPP. In the instance of a first or second incident of plagiarism, proceed to Part B. In the instance of a third incident of plagiarism, proceed to Part C.
Commence these steps after completing Part A - Management of Plagiarism Identification and Reporting. The student may request a hearing within 7 working days of being notified. If a student does not request a hearing within 7 working days, the School will proceed on the basis the student does not wish to appeal the report and will process a result in accordance with the incident number (1 or 2). The School/Centre must notify the student of the penalty incurred. 2. Following receipt of the request for a hearing, the Dean/Director or nominee arranges a meeting (in person or via phone or video link) as soon as practical between themselves, the PO and the student, giving the student at least 7 working days' notice. A student should always be granted a hearing to provide them with the opportunity to present evidence to refute or mitigate the charge. This must be used as an opportunity to educate a student on plagiarism and how to avoid plagiarism. A student should be notified of the result of a hearing in writing as soon as possible. If the student is found 'not guilty' of plagiarism, then the assessor is informed to reverse the forfeiture of credit. The School/Centre should destroy any documents pertaining to the case. If the report of plagiarism is upheld at the hearing, the notification must include details of the University's appeals process and how the student can access this. At the conclusion of a hearing under Regulation 6.1.1, section 5(1), a confidential written report by the nominated person will be submitted to the Dean/Director or nominee within 3 working days of the student being notified of the decision. Also, if the report is upheld, all paperwork about the incident and a Plagiarism Report is to be forwarded to Central Records for retention and entering into the Plagiarism Register. NB. Attachments 11 and 12 contain details of the University’s appeals process. If a first or second incident is upheld at the School/Centre hearing, a student has the right to appeal the result to the University Appeals Committee. The student must lodge an appeal with the University Appeals Committee within 7 working days of receiving notification of the outcome of the School/Centre hearing. In accordance with Regulation 2.2, a student can only appeal to the Appeals Committee if they have new evidence that was not known at the time of the School/Centre hearing or if an irregularity of procedure has taken place. An appeal must be submitted by a student in writing to the EO, University Appeals Committee. The University Appeals Committee has the power to recommend the dismissal of the plagiarism report. The EO of the University Appeals Committee will advise the student of the outcome of the request for an appeal within 10 working days. International students within 10 working days, due to visa requirements and limited period for appeal before expiration of student visa. Domestic students can have longer, period of time to be advised. All students who have used the appeals process must be made aware of the external process available to them. At the conclusion of any hearing and appeal process, if plagiarism is upheld, all paperwork about the current incident and a Plagiarism Report is to be forwarded to Central Records for retention and entering into the Plagiarism Register. If the report is not upheld the School/Centre should destroy any documents pertaining to the case. Schools/Centres should not retain any copies of a specific student's plagiarism documentation. Everything must be returned to Central Records including copies of all correspondence sent to students regarding an incident, notes taken during hearing/s if applicable, and any additional information. A third incident of plagiarism is sent directly to the Student Discipline Committee. No hearing is held within the School/Centre. The Dean/Director or nominee of the School/Centre forwards relevant material with a request for a hearing to the Executive Officer of the Student Discipline Committee. 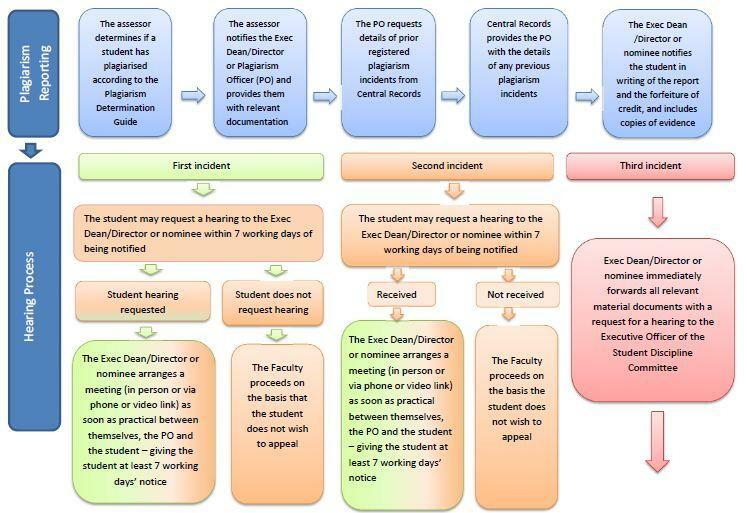 Within 10 working days of receipt of the complaint,the EO of the Student Discipline Committee organises a Committee meeting within 21 working days and sends notification to the student and Dean/Director or nominee of the School/Centre. A copy of the Regulation 2.4 and Statute 2.4 and Regulation 6.1.1. Students can attend the hearing either in person, or via phone or video link. A student should be notified in writing of the result of a Student Discipline Hearing within 7 working days of the hearing. The outcome may affect a student’s visa (if an international student). This notification must include details of any further steps in the appeals process available to the student. 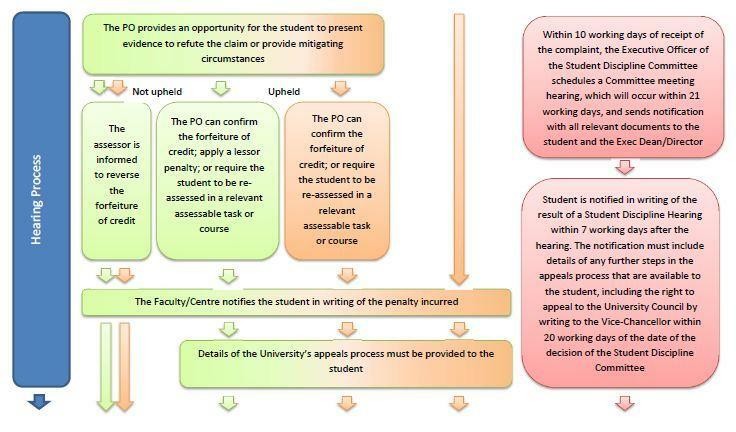 Template for the letter informing a student of the outcome of a Student Discipline hearing is held by Legal and prepared by the Chair of the Student Discipline Committee. A copy of this letter should be forwarded to the Dean/Director or nominee of the School/Centre. If an international student is involved, the Centre for University Partnerships (CUP) must be notified of the result of a Student Discipline Hearing if the incident is upheld and the student’s enrolment is terminated. 3. If an appeal to the Student Discipline Committee is unsuccessful, a student has the right to access the external complaints and appeals process of the Victorian Ombudsman within 10 working days. EO, Student Discipline Committee All students who have used the appeals process must be made aware of the external process available to them. At the conclusion of any hearing and appeal process, if plagiarism is upheld, all paperwork regarding the current incident and a Plagiarism Report is to be forwarded to Central Records for retention and entering into the Plagiarism Register. If the report is dismissed, the School/Centre should destroy any documents pertaining to the case. The EO of the Student Discipline Committee has a separate Plagiarism Register and details of the plagiarism will be recorded on this Register. Schools/Centres should not retain any copies of a specific student’s plagiarism documentation. Everything must be returned to Central Records, including copies of all correspondence sent to the student about an incident, notes taken during hearing/s, and any additional information. * The educative, preventative and detection strategies, outlined in this procedure, are taken from 'Assessing Learning in Australian Universities', Centre for the Study of Higher Education, The University of Melbourne. Plagiarism Report form and associated paperwork where allegations are proven and the student is permanently excluded or expelled from the course or institution Central Records Chair, Academic Board 15 Years after final decision. Plagiarism Report form and associated paperwork where the allegations are proven and the student is penalised or sanctioned (including temporary suspension) but is not excluded or expelled. Central Records Chair, Academic Board 7 years after final decision.